Po-wei Weng is a researcher, musician, conductor, and teacher. He holds a M.A. in musicology from National Taiwan University and a M.A. in ethnomusicology from Wesleyan. He is currently ABD in ethnomusicology at Wesleyan University. He has a number of publications on Chinese traditional and operatic music, ritual music, Chinese martial arts film music and music semiotics. His research interests include traditional instrumental and theatrical music in contemporary society, East Asian popular culture in post-colonial and transnational contexts, music and technology, and music in film and television. As a musician, he plays Chinese flute since 12, and he also plays various wind and percussive instruments in Peking opera ensemble and Chinese orchestra. He also directed Wesleyan Chinese ensemble for years. As a scholar, he taught various courses and was frequently invited to give lectures, especially on the topic of Peking opera music, at many U.S. and Taiwan’s colleges, such as Wesleyan University, Mount Holyoke College, Skidmore College, DePauw University, Central Connecticut State University, and National Taiwan University. Through various video examples and live demonstration, this presentation introduces the essence of music and performance in Peking opera, delineating fundamental concepts and aesthetics that Peking opera artists apply to form plays, such as symbolism, conventionalization, and special concepts of time and space. It will also introduce the formation, use, and function of Peking opera music, with a focus on the instrumental music section. Through this presentation, audience explore the basic artistic “language” of Peking opera music and performance for future appreciation of this performing arts form. Visit www.yourlibrary.ca/events or call 604-231-6413 for details. 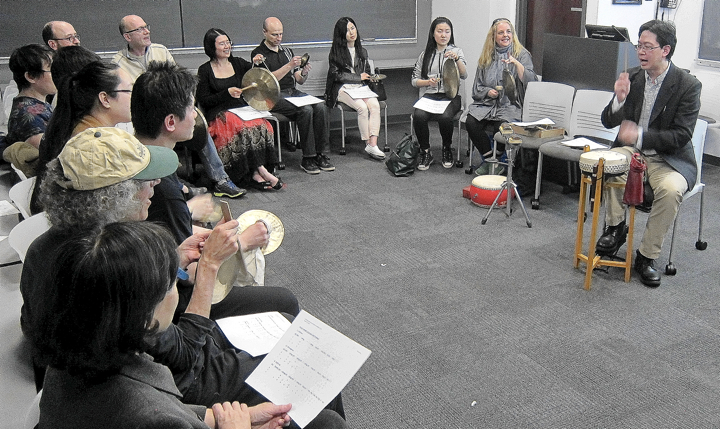 Ethnomusicologist and musician Po-wei Weng will lead the participants to explore the formation and fundamental concepts of Peking Opera percussion music. Learn how to recite the rhythmic patterns in Peking Opera tradition and play them on Chinese percussion instruments. It will provide an enjoyable, inspiring, and hands-on experience, and bring the participants different perspectives of organizing musical sounds and expressing music ideas. Great opportunity for composers, musicians, and music lovers. Also a good aspect for people interested in theatre and dance to learn about the interaction between music and movements. Jingju Luogu 京劇鑼鼓, also known as Peking opera (Beijing Opera) percussion music, is a small percussion ensemble consisting of five core percussive instruments, danpigu (單皮鼓single-skinned drum), ban (clapper), xiaoluo (small gong), naobo (a pair of cymbals), and daluo (big gong), played by four musicians. Jingju Luogu is a pattern-based music, which means the musicians need to learn and memorize a number of percussion patterns (about 200 patterns commonly used in Peking opera) and play their basic, combinational, and variation forms following the direction of the drummer. When learning the patterns, Peking opera musicians practice a special type of “oral notation” named luogujing 鑼鼓經, an onomatopoeic system that uses verbal syllables to represent different percussion sounds, playing techniques, and musical expressions. 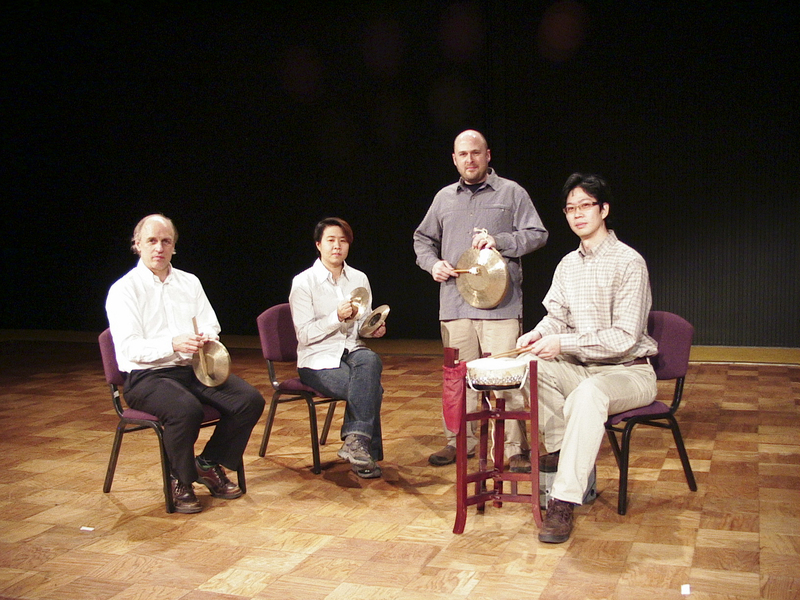 This system has been developed by the Peking opera artists (both musicians and actors) not only as a performance aid to substitute real percussion for rehearsal and informal performance, but also as a special kind of “language” that can be used for daily conversation.